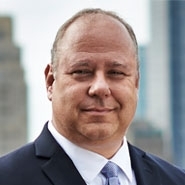 John St. Jeanos focuses his practice on commercial real estate transactions, with a particular emphasis on institutional financings, acquisitions, sales and development. John has structured, negotiated and closed numerous complex real estate transactions throughout his career. He has substantial experience representing banks, insurance companies, pension funds and other major financial institutions, as well as owners and developers in the structuring, financing, acquisition, sale and development of commercial, residential and mixed-use properties throughout the U.S.
John also represents clients in all aspects of construction, permanent, bridge and mezzanine financing. He also regularly counsels institutional and private lenders in the resolution of troubled loans, including loan workout and restructuring transactions.